With the right technique, 100% whole wheat bread doesn't have to be heavy and dense. It can bake up wonderfully soft and light. I adore everything about whole wheat bread, from its hearty texture and graham-like flavor to the general aura of virtue that comes with making anything from whole grains. When ordering out, it's my favorite side for sopping up runny yolks on a breakfast plate, my ultimate sandwich bread. And assuming there's plenty of butter and jam, the perfect accompaniment to a simple mug of coffee. Whole wheat bread has an unfortunate reputation for turning out heavy and dense at home. It can have a texture that's prone to tearing or crumbling apart, especially when sliced thin for sandwiches. These attributes are often identified as an inescapable reality of 100% whole wheat formulas, as the inclusion of wheat bran and germ can interfere with proper gluten development, resulting in a poorly risen, too-tender loaf that lacks the structure and chewiness of a classic white bread. As a result, an overwhelming number of recipes for "whole wheat" bread will actually include a good deal of white bread flour, often 50%. This improves a standard loaf's chewiness and rise, but it also dilutes the characteristic flavor and nutrition of whole wheat. That doesn't mean it's impossible to make a fluffy, well-structured whole wheat loaf that's high-rising and chewy. It just means you'll need a slightly different approach than the one you see in run-of-the-mill recipes—one that involves a bit more time, power, and water. The first key step for my whole wheat bread is to start with an autolyse. With this technique, bakers combine the flour and water up front and then allow the mixture to rest for some length of time before kneading. This waiting period kicks off the enzymatic breakdown of starch, while giving the gliadin and glutenin proteins in the flour time to hydrate and mingle, forming gluten. It's not an exciting process to behold, but it does some amazing things for the dough by fostering gluten formation prior to the gluten development achieved through kneading. An autolyse can be helpful for many types of bread, especially in a commercial setting, but it's particularly useful at home for doughs that struggle to achieve sufficient gluten development in the first place, like whole wheat bread. What's more, this hydration period softens the bran and germ in the dough, leading to a lighter, softer loaf. The timing of an autolyse will vary from recipe to recipe, with some as short as a few minutes and others lasting overnight, but after testing a dozen or more intervals for this loaf, I was happiest with a two-and-a-half-hour autolyse (you can see some of my testing shots on Instagram). There's definitely some wiggle room if you need a buy a bit of time or move things along, but substantial deviations can lead to suboptimal results. Even with an autolyse, gluten development can be difficult in a 100% whole wheat dough. Whenever I'm faced with a challenging dough that needs a lot of structure (like superchewy bagels, for example), I break out my food processor. When it comes to intensive gluten development, food processors can do near miraculous work. After adding some brown sugar, salt, and yeast, the food processor is able to take my 100% whole wheat dough from a gnarly blob to a strong and satiny dough in just 75 seconds, without any risk of oxidation or overheating of the dough and with little risk of overheating or burning out the machine’s motor (which is more common with certain brands of small but colorful stand mixers with plastic gears). After processing, the dough will have enough gluten development to pull a small piece into a translucent sheet or, in baker-speak, a windowpane. With a 100% whole wheat dough, this level of gluten development can be very difficult to achieve by hand or even in a stand mixer. Which is to say the food processor isn't an optional shortcut for this dough but a vital tool. 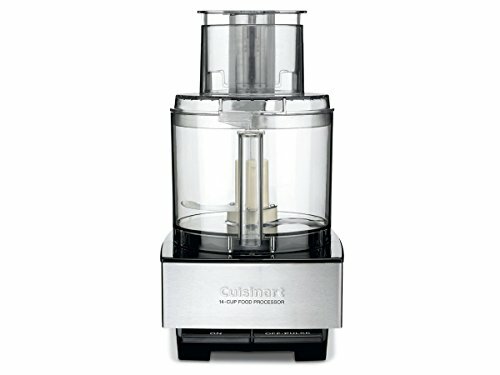 For this recipe, I used both the 14-cup Cuisinart at our test kitchen and my 16-cup Breville Sous Chef without incident, but for smaller machines, it will be necessary to process the dough in stages (see our food processor equipment review for more info on our recommended models). Whole wheat dough typically requires more hydration than white bread due to the wheat bran's absorbency. But when I gave the dough all the water it needed up-front with the autolyse, it was too sticky and wet for my food processor. I was able to sidestep the problem by reserving a small portion of water to incorporate after developing the gluten. Adding the water in two stages allowed for ample hydration during the autolyse, producing a dough with enough structure for the food processor to handle, while creating a soft and elastic dough that bakes up chewy, moist, and light. Along with this second addition of water, I also add a splash of oil. This likewise keeps the dough from turning sticky early on, but its inclusion improves the flavor, texture, and shelf life of the finished loaf. Clear, neutral oils like safflower work well, or you can add another layer of nutty flavor with options like toasted pumpkin seed oil or toasted pecan oil. After adding the water and oil, the dough is processed until smooth and then transferred to a lightly greased bowl for the first rise. At this stage, it should feel sticky, wet, and elastic, very unlike a typical whole wheat dough. As with any bread, timing the first rise will depend on the dough and environment, as "room temperature" can range from well below 65°F (18°C) to above 85°F (29°C), depending on the season. But in an approximately 70°F (21°C) environment, expect things to take about two hours. Or, if desired, the dough can be refrigerated to substantially slow things down. However the timing works out, when the dough has roughly doubled in volume, turn it out onto a clean surface that's been lightly dusted with whole wheat flour. I form the loaf by folding the dough in thirds, using the heel of my hand to seal the dough against itself to form a tight roll. From there, I transfer it to a well-greased one-pound loaf pan (this tapered style will measure nine-by-five inches at the top and eight-by-four inches at the bottom). I loosely cover the dough with plastic and proof until it's well risen and light but resilient, able to slowly spring back from a gentle poke. If the dough feels dense and firm and resists taking an impression when poked with a finger, I let it continue to rise. As with the first rise, this process will move faster or slower depending on environmental conditions, but expect about 75 minutes at 70°F. Keep a close eye on the dough at this stage, checking it frequently to avoid overproofing (letting it puff up so much that it starts to lose structure). After the second rise, bake the loaf until it's well risen and golden brown, giving up a hollow sound when thumped. This should take about 45 minutes at 350°F (177°C) or until the loaf reaches an internal temperature just over 200°F (93°C). Immediately de-pan the loaf, and let it cool completely on a wire rack. While warm, the loaf will be fragile and easily compressed, with a gummy texture. Once cool, however, it will be sturdy and light, chewy and soft, crisp around the edges and moist in middle. Because it's so well structured, it can be thinly sliced for sandwiches so long as you have a thin, serrated knife with sharp teeth (a thick, dull blade will only smoosh the loaf). Daniel has done an extensive review of the best serrated knives in the past; his favorite (and mine!) is the 10-inch Tojiro Bread Slicer, which makes beautiful slices of any loaf. Thanks to an autolyse, a food processor, and a two-pronged approach for adding the water and oil, this 100% whole wheat bread bakes up chewy, moist, and light, with a soft crumb and marvelous staying power (it'll keep for a week at room temperature in a paper bag or bread box). It may not be the fastest recipe around, but it's one that can still be knocked out in less than eight hours, with very little hands-on attention—the perfect loaf for puttering around the kitchen on a lazy Sunday.